Trace their ancestry from China, Ireland, Mexico or the Philippines? Are children under 5? Speak Spanish at home? Have their cars stolen? Are heterosexual or gay? Divorced? Live alone? Give birth each year? 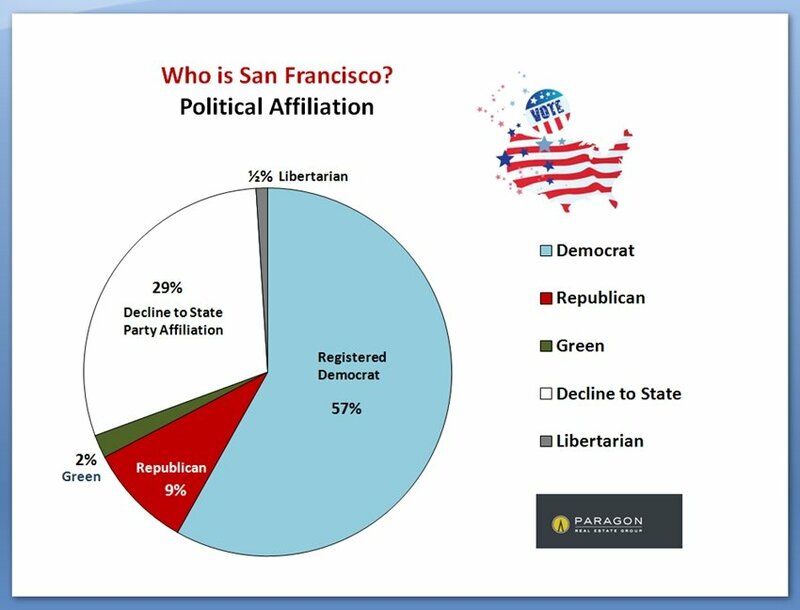 Vote Libertarian? 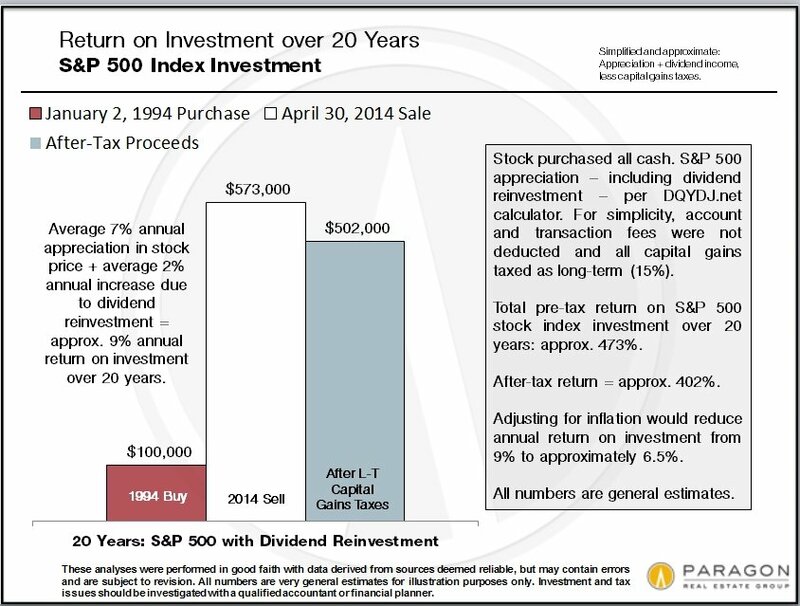 Earn over $200,000/year? Have graduate degrees? There is no city in the world like San Francisco – and here are some of the interesting details. The information on the charts above was researched in 2011- 2012 with much of it based upon the U.S. Census data of 2010; the zip-code demographic breakdown and the rankings below were researched in 2014. There may be some small discrepancies between three reports, which are now cobbled together on this one web page. foreign-born population, household size, age and other criteria. The below charts and table are based upon U.S. Census surveys from 2010 – 2013. 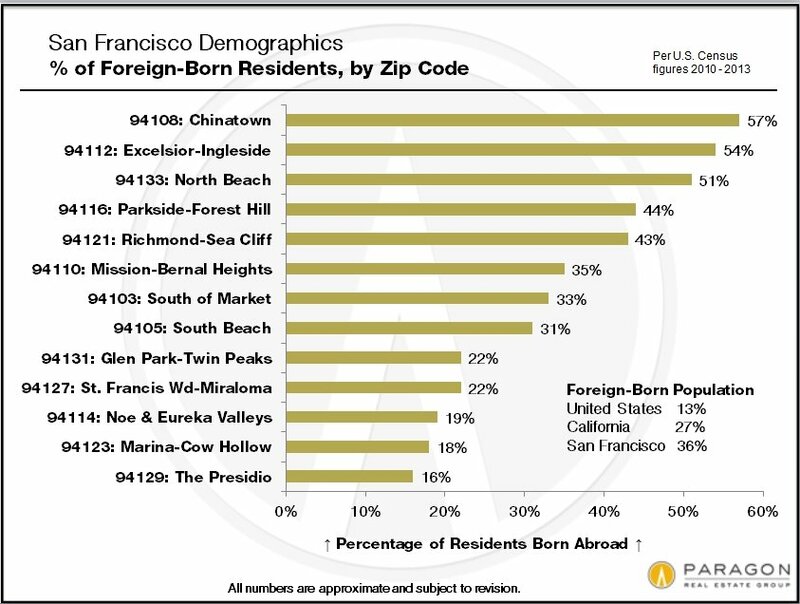 Please note that zip codes often contain neighborhoods of widely different demographics. 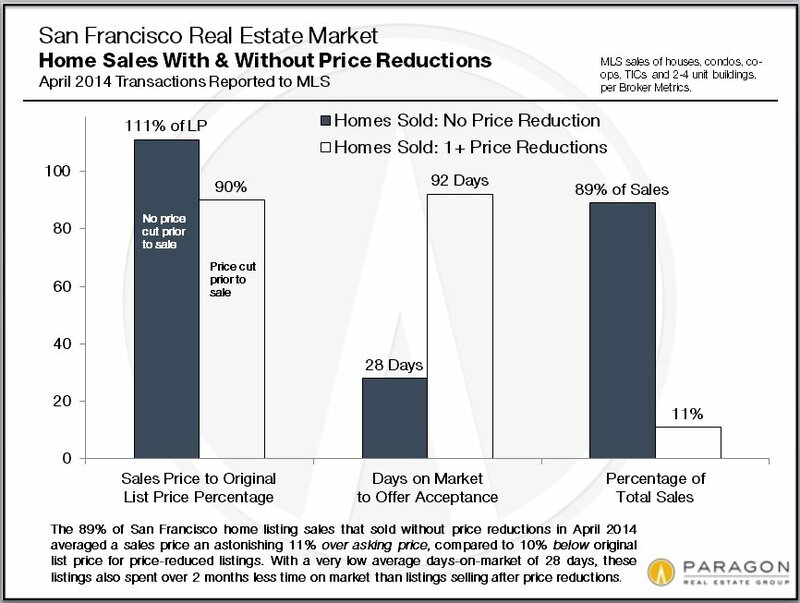 For example, 94115 includes Pacific Heights, one of the most affluent areas of the city, as well the Western Addition, which is less affluent: when mixing areas such as these in one zip code, you end up with statistics that don’t really apply to either. 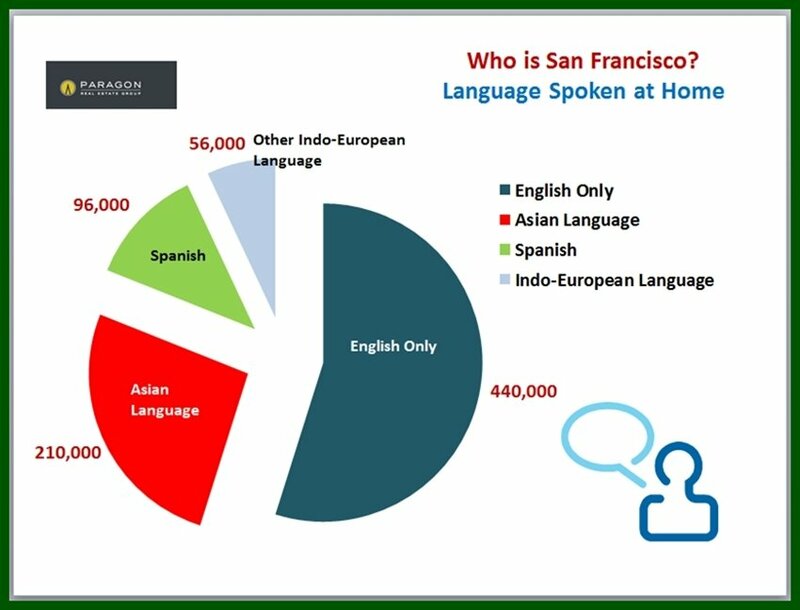 Data like this is constantly changing and zip codes are blunt instruments for demographic investigation, but we still found the analysis to generate interesting, new insights into San Francisco. Below the charts is a full table of the data we collected. 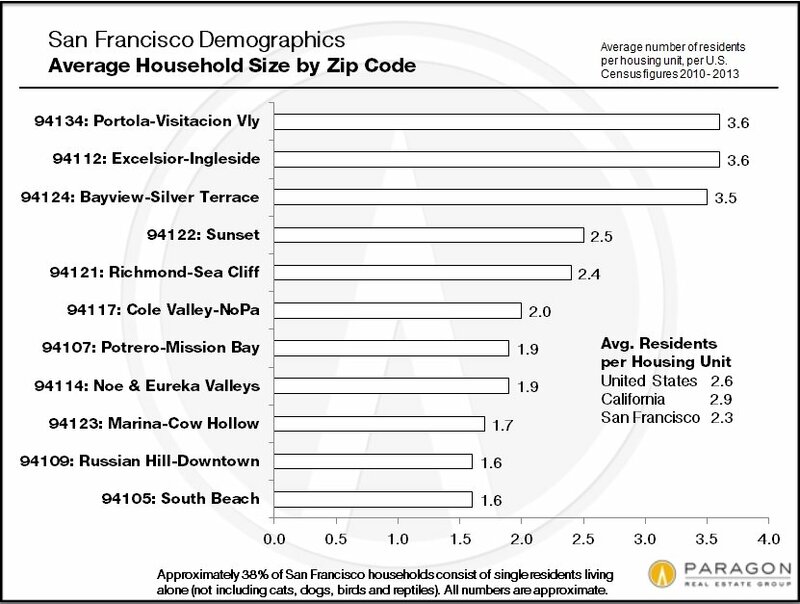 The neighborhoods associated with zip codes in the charts and table below are simply representative of each area; other neighborhoods are often included within one zip code and many neighborhoods are divided between different zip codes. Median Household Income Many factors impact this statistic: household size, level of education, percentages of homeowners vs. renters, whether the rental units are subject to rent control, median age and other cost of housing issues besides rent control. 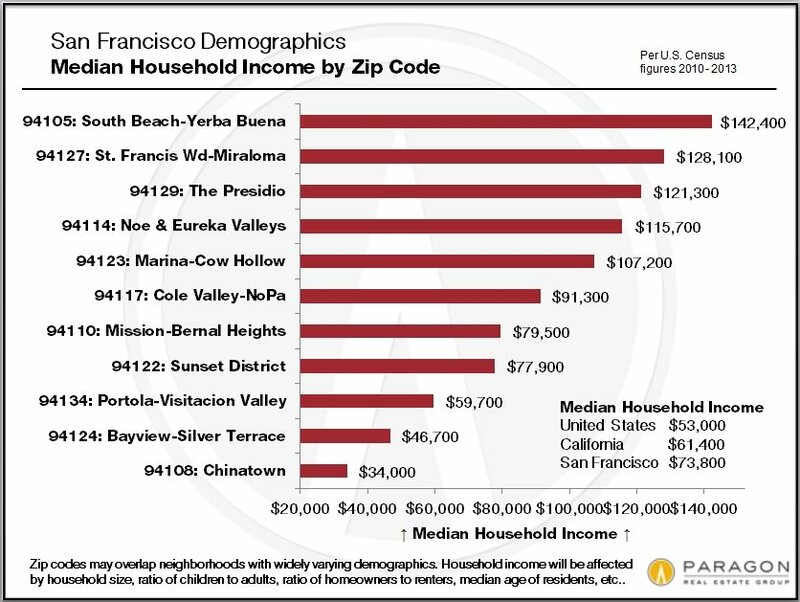 The South Beach-Yerba Buena zip code takes top place for median household income in San Francisco. Interestingly, it is at the bottom of the ranking for average household size. This zip code is dominated by newer condo projects, many of them at the top of the price scale and the rental units here, which make up over half the housing, are typically not under rent control. 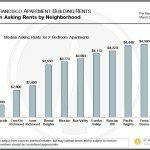 The second ranked zip code for income is quite different: the St. Francis Wood-Miraloma Park area has a completely different ambiance, very few condos or renters, older residents and bigger households. 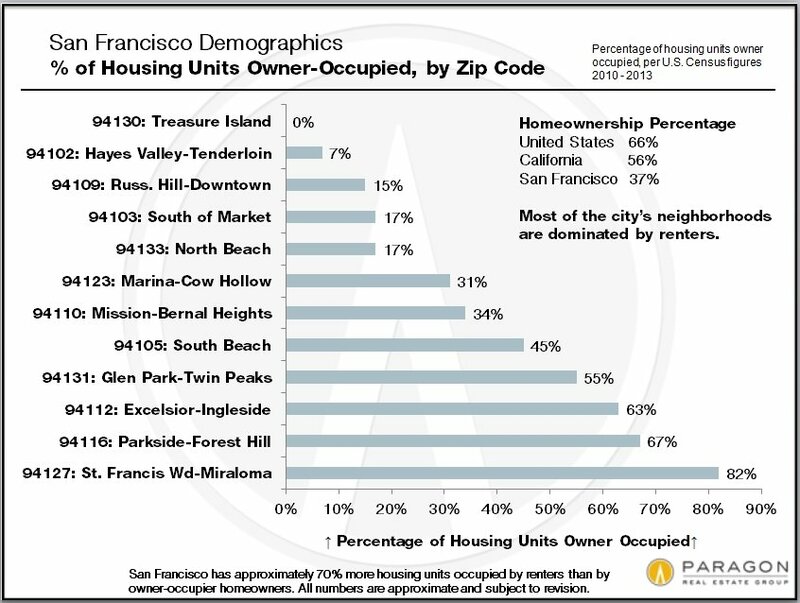 And number 3 is the Presidio Trust zip code with no homeowners, all renters but no rent control, and younger residents than either of the first two. 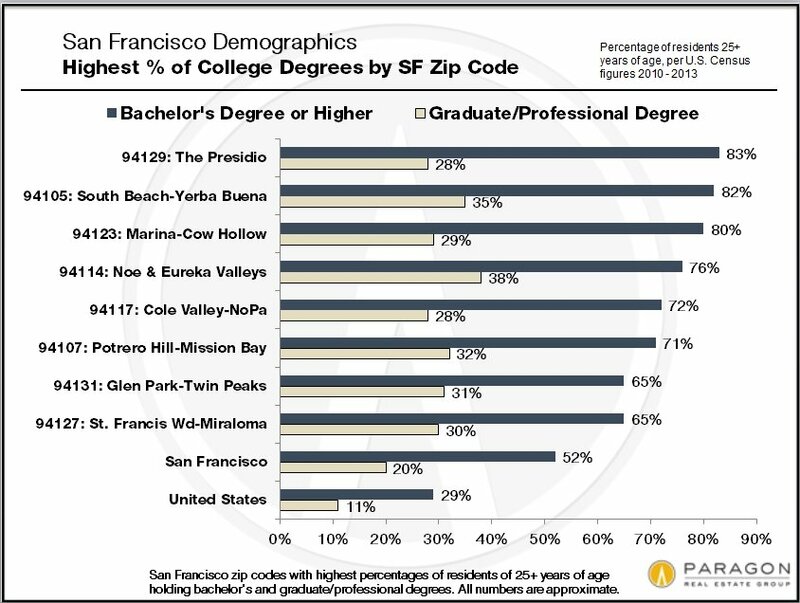 All 3 of the top zip codes, however, have very high percentages of residents with bachelor’s, graduate and professional degrees. 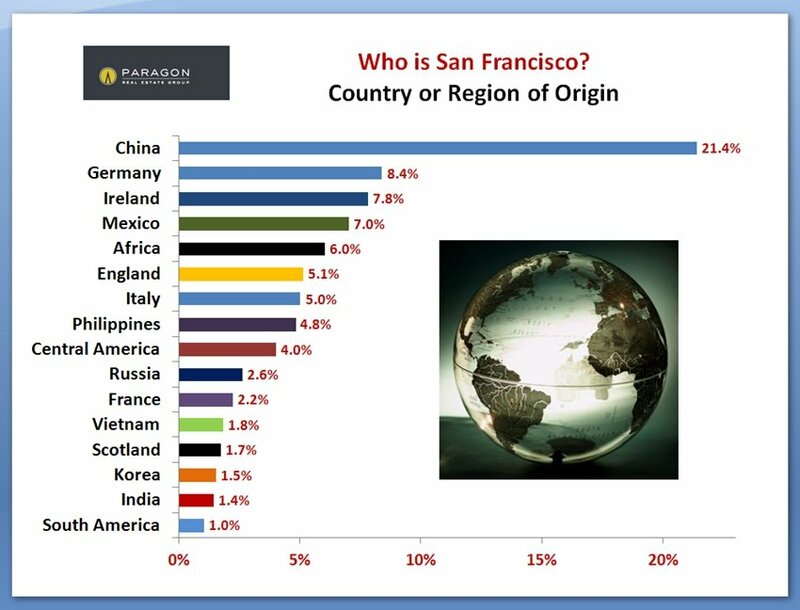 Of major metro areas, San Francisco ranks 4th in the country in percentage of foreign-born residents. 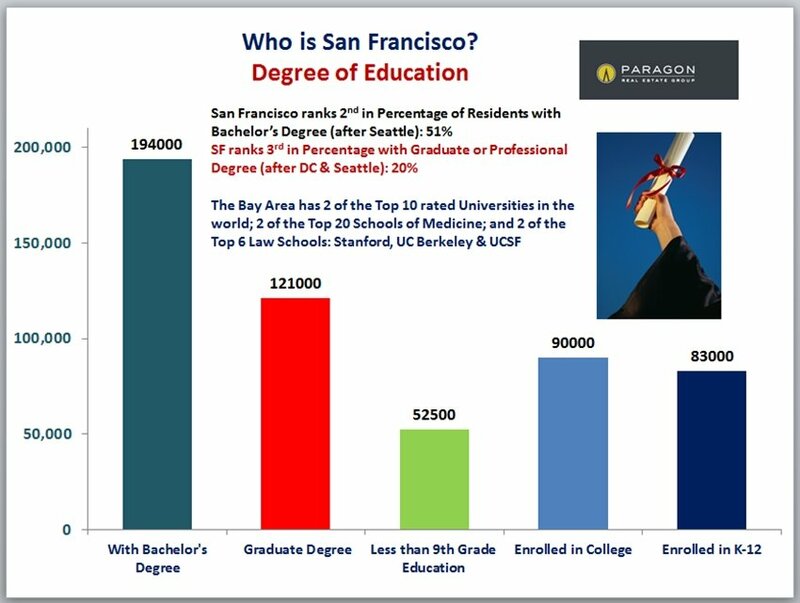 San Francisco ranks 2nd in the country for percentage of residents with bachelor’s degrees and ranks 3rd for percentage of residents with graduate or professional degrees. Not surprisingly, when looking at zip codes, educational attainment and household income typically go hand in hand. 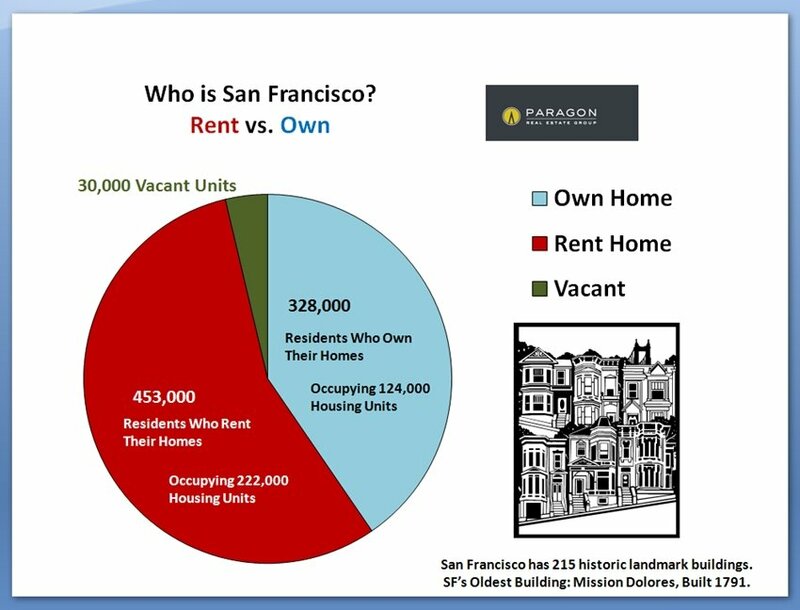 San Francisco has approximately 70% more housing units occupied by renters than by homeowners. 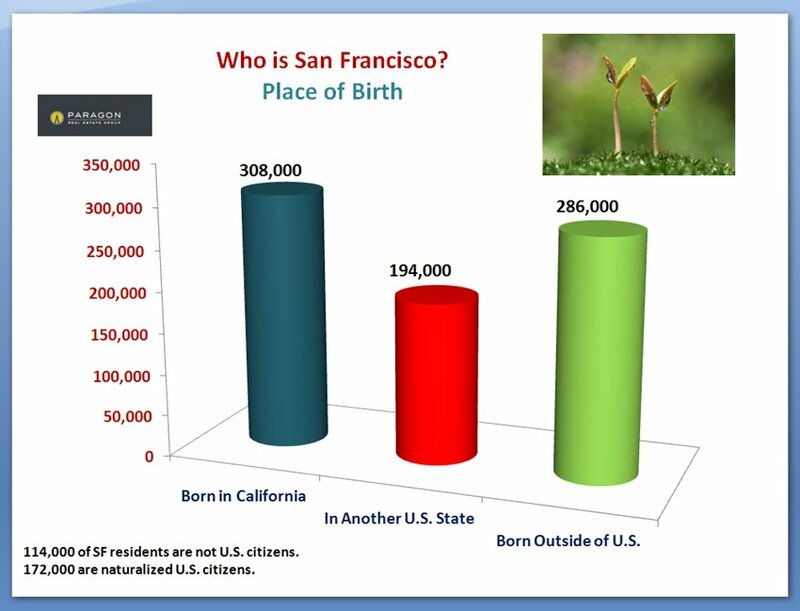 San Francisco has the lowest percentage of children of any major U.S. city and 38% of residents live alone. This brings the city’s average household size down, however the statistic varies widely by neighborhood. 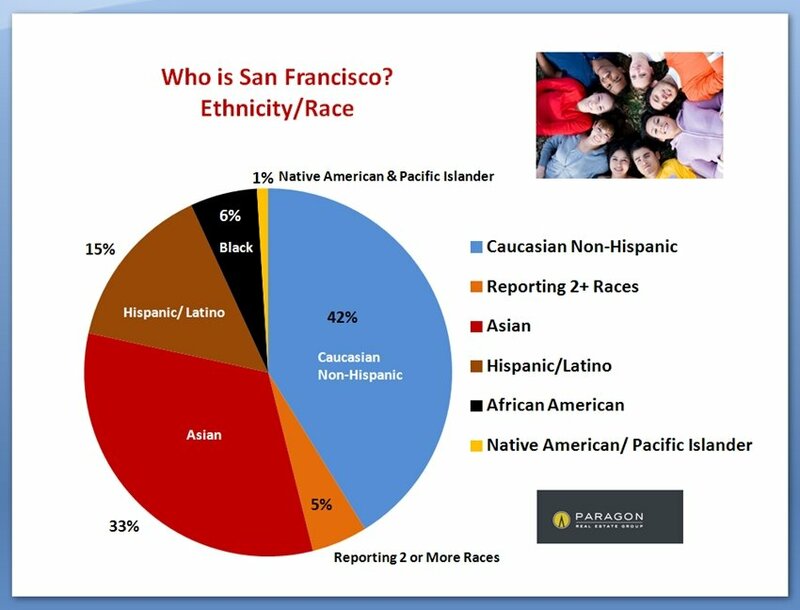 Below is the table with all the San Francisco zip code demographic data we collected. It will be easier to read if you adjust your screen-view to zoom 125% or 150%. 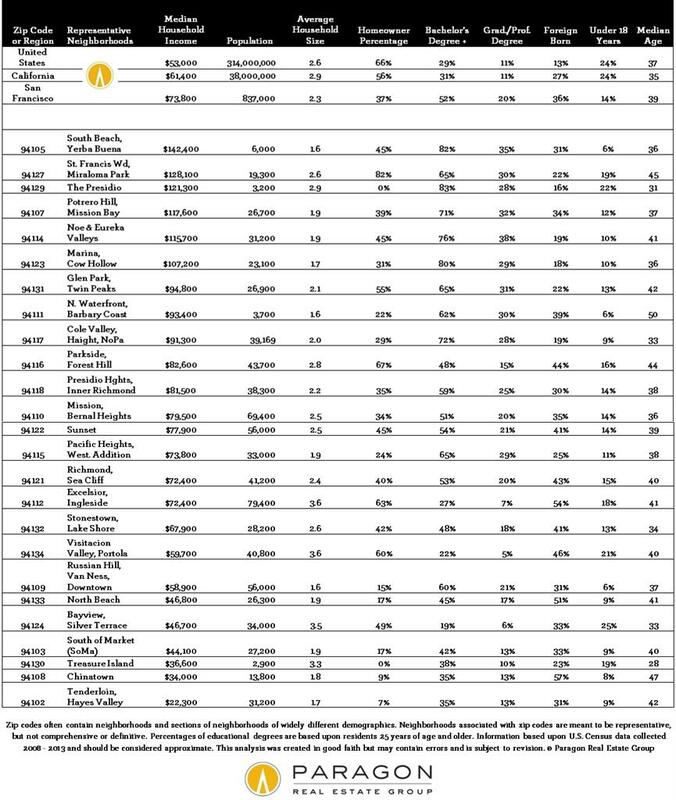 The zip codes in the table are in order of median household income. 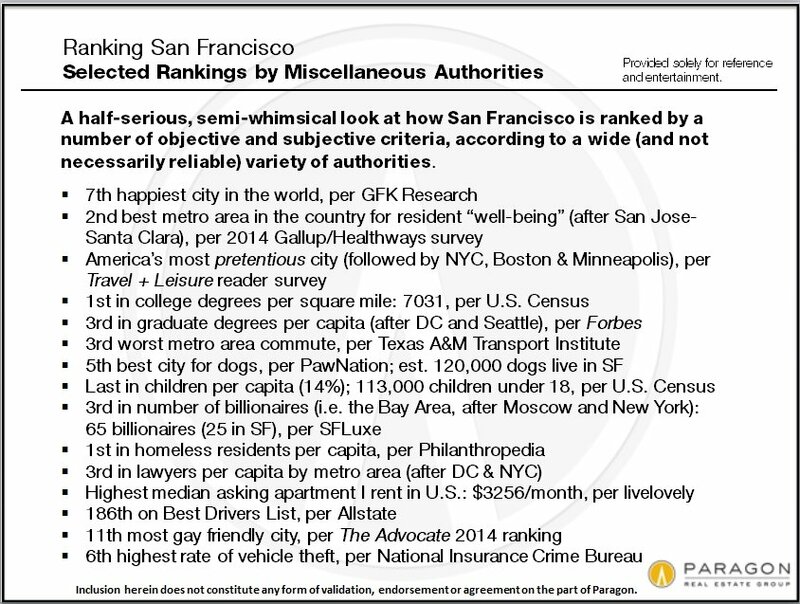 Below is a half-serious, semi-whimsical look at how San Francisco is ranked by a number of objective and subjective criteria, according to a wide (and not necessarily reliable) variety of authorities. Typically, these rankings were made within the last 2 or 3 years. Many should be taken with a large grain of salt. 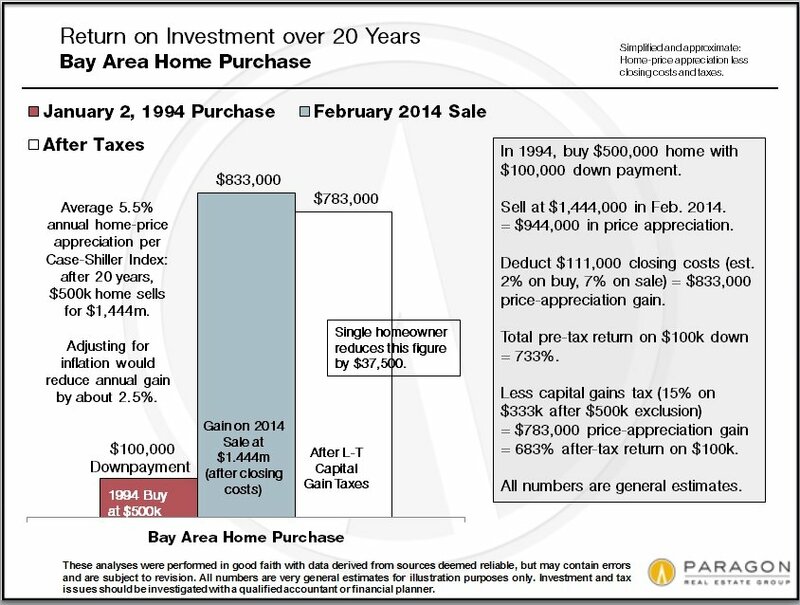 1st in U.S. for real estate investment/development opportunity, per Urban Land Inst. 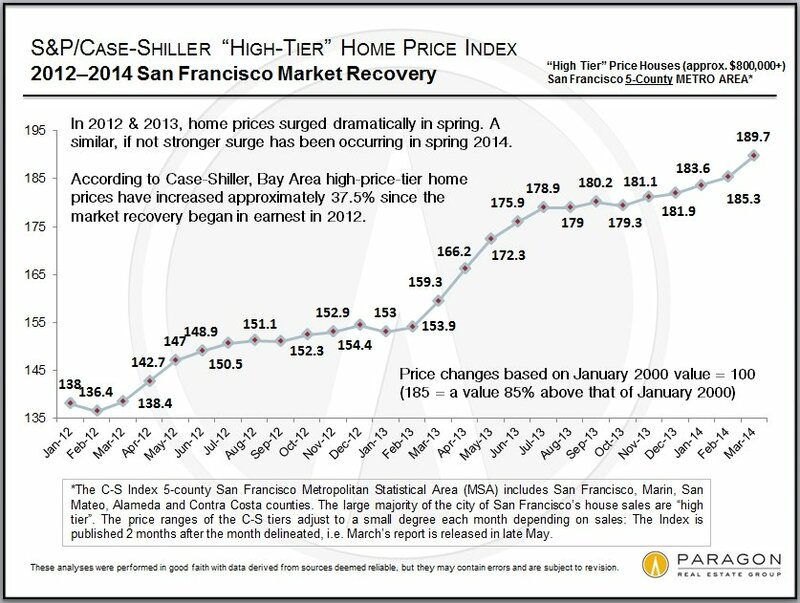 The new Case-Shiller Index report for the 5-county San Francisco metro area , for March, is showing the same acceleration in home prices that buyers and sellers are experiencing in the market. The 2.4% increase from February to March 2014 is the largest since spring 2013, and further significant increases are expected in the Index reports for April and May when they come out in the next two months. 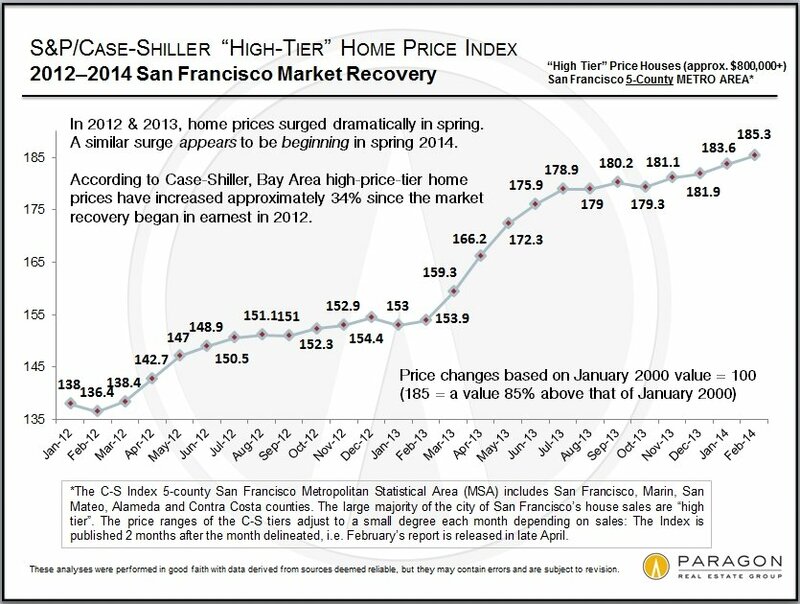 Nationally, home prices saw only a .17% increase month over month, and Case-Shiller’s 20-City Index showed a .87% increase, so San Francisco and the Bay Area is strongly outperforming the rest of the country in home price appreciation. Since the market recovery began in earnest in early 2012, northern Bay Area home prices have appreciated approximately 37.5% through March, according to Case-Shiller. 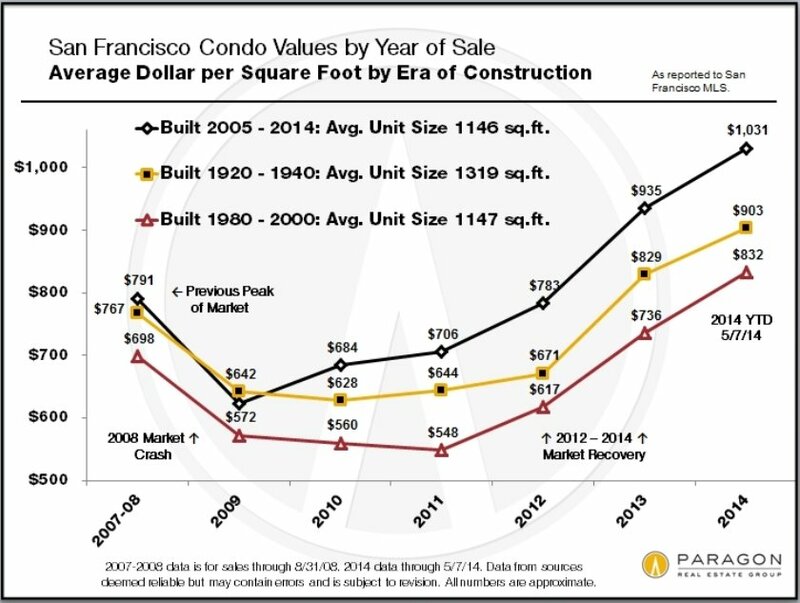 We haven’t found an easy place for construction data by unit size, so this chart is extrapolated from the last 7 years of SF MLS sales of condos built 2001 -2014. 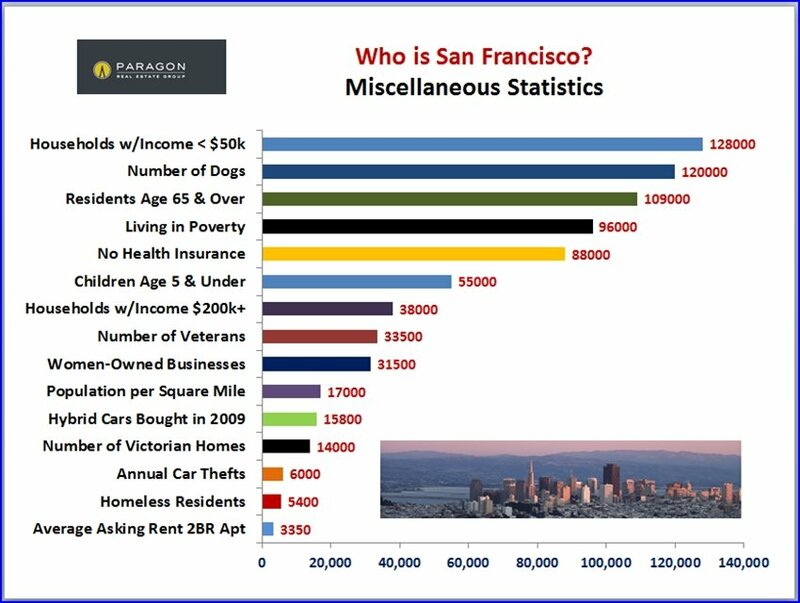 It may not apply perfectly to units built as apartment rentals or affordable housing.Typically, the smaller the unit, the higher the dollar per square foot value on sale or rental, however in San Francisco, 3+ bedroom condos are often high-floor units with spectacular views that sell for extraordinary sums – but these would be outliers to the general rule. 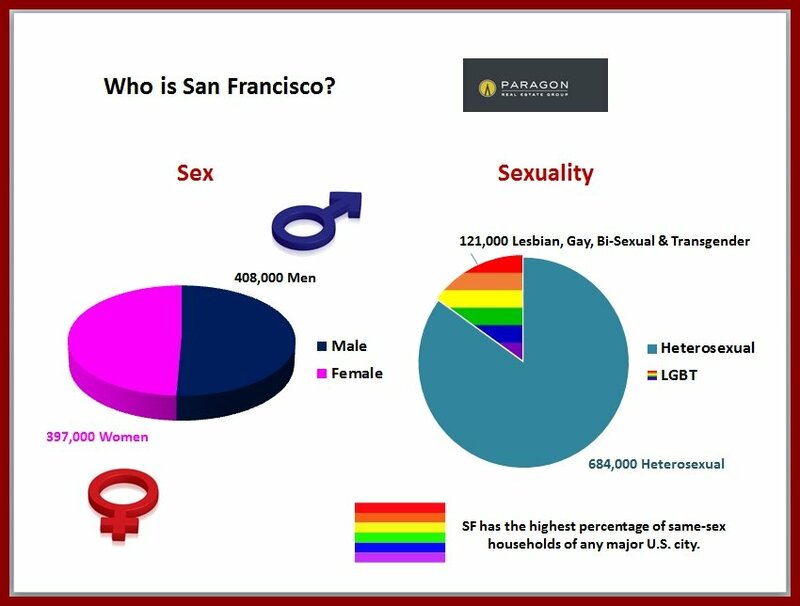 The city plan appears to have a bias for 2-bedroom units, which it designates as “family units” – this may be an anachronism considering that 38% of city residents live alone and that SF has the lowest percentage of children of any major U.S. city. Of course, many singles and couples like to have a guest bedroom or home office. 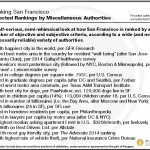 Within its 47 square mile envelope, San Francisco is already the 2nd most densely populated city in the United States, and it’s growing denser, more affluent and more expensive. 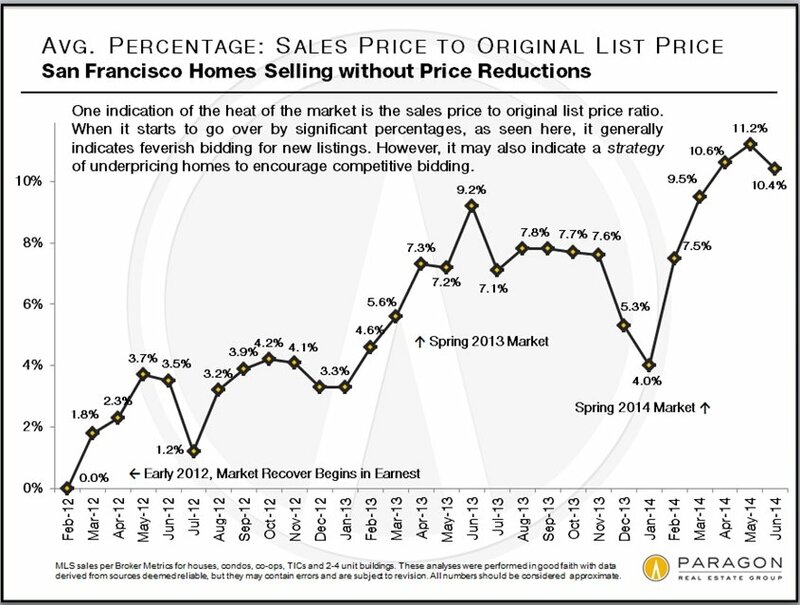 May 2014 Report with 13 Custom ChartsThe charts included are mostly based on the San Francisco Planning Department’s excellent Housing Inventory and Pipeline reports, which can be accessed using the links at the bottom of this article. Quotes below are excerpted from these reports. Packed with information, the data in one report section will not always agree perfectly with that in another – due to the multiple sources of data used by the Planning Department – and this is reflected in our charts as well. 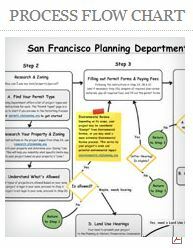 In the complex, lengthy process of new-housing application and review, public hearings (and, lately, ballot proposals), revisions, entitlement, permitting, construction and completion, how and when a project is counted may vary. Housing units are being built and being removed, and there are so many types: rental or sale, market rate or affordable, social-project housing or luxury condominiums. Last but not least, this landscape is in constant flux – new projects, plan changes, and shifts in economic and political realities. Everything below is simply a good faith estimate. 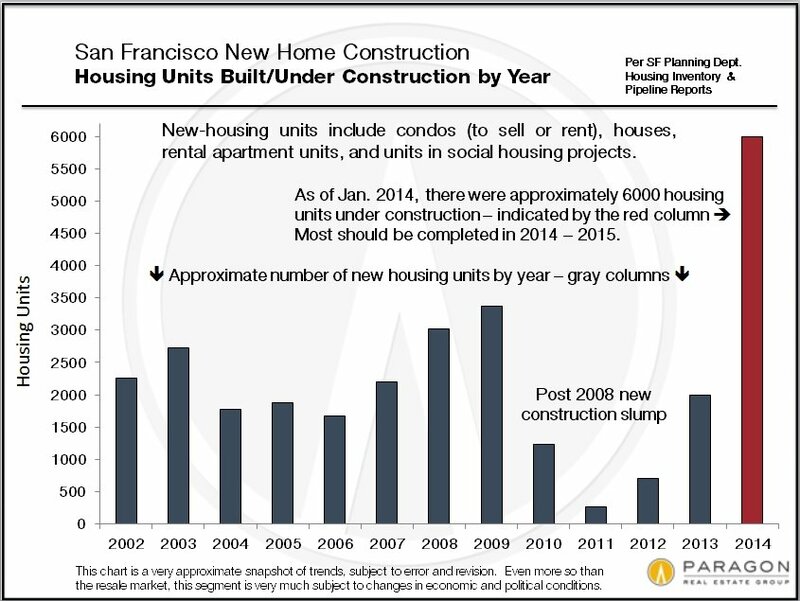 The basic reality is that San Francisco, after its recent 2008-2012 new-construction slump, is now experiencing a building boom. 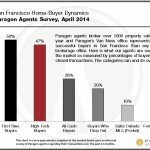 So far, however, it has not been able to keep up with population growth and rising buyer/renter demand. Adjusting your screenview to zoom 150% will make the charts that much easier to read. Besides the above projects, rarely a week goes by in which new commercial property sales aren’t being announced – such as the Honda dealership lot and the KRON Building, both on Van Ness – with plans for large-scale residential development projects. 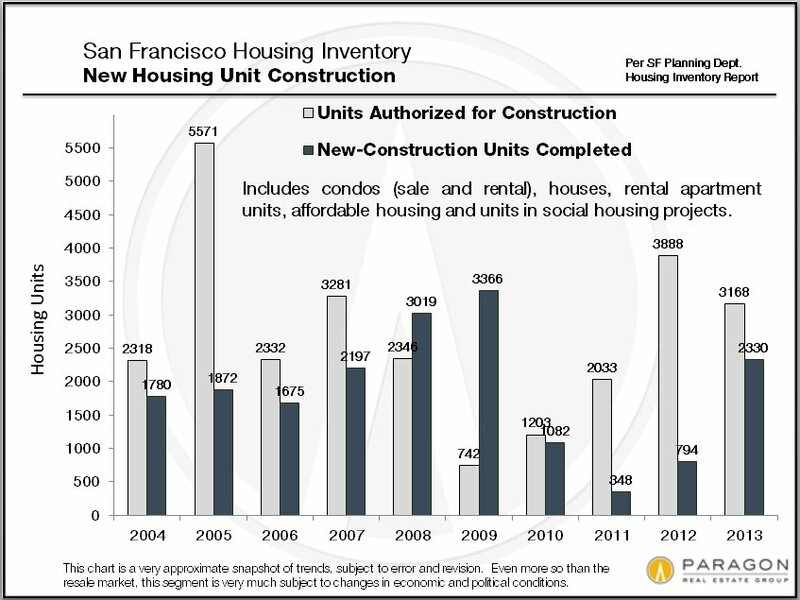 However, in 2012, the city agreed to allow the construction of 375 “micro-units,” apartments of 220 to 300 square feet, including kitchen and bath. 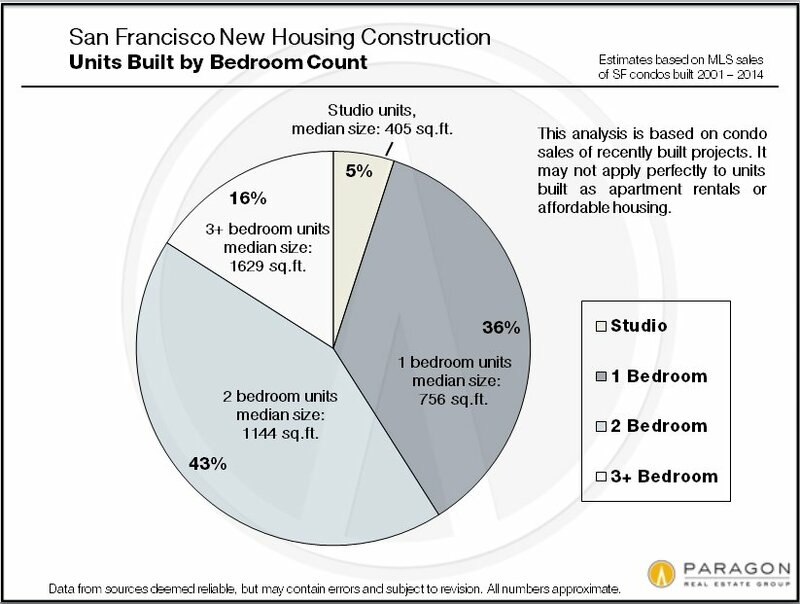 A few dozen have been built – one article mentioned a rental rate of $1850/month – and another 160 are under construction in the mid-Market area. 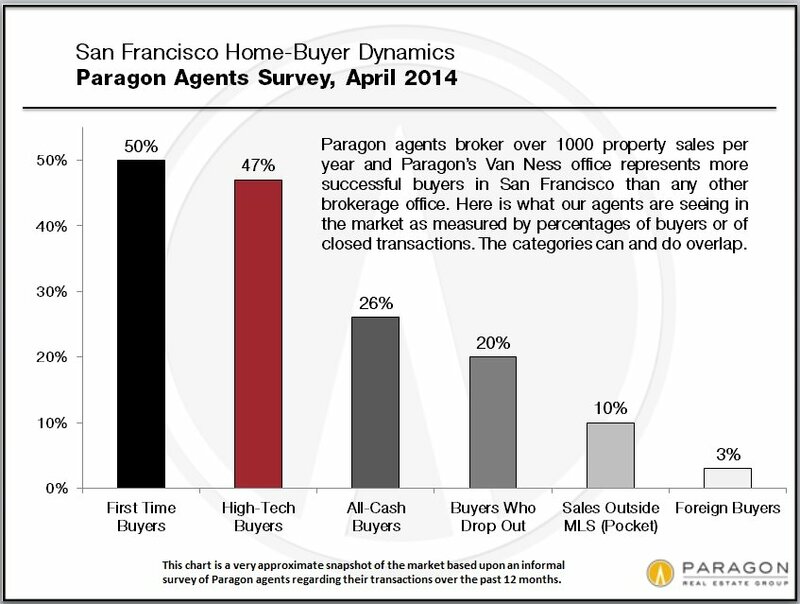 It will be interesting to see how this trend develops (or doesn’t) in both the rental and for-sale markets. 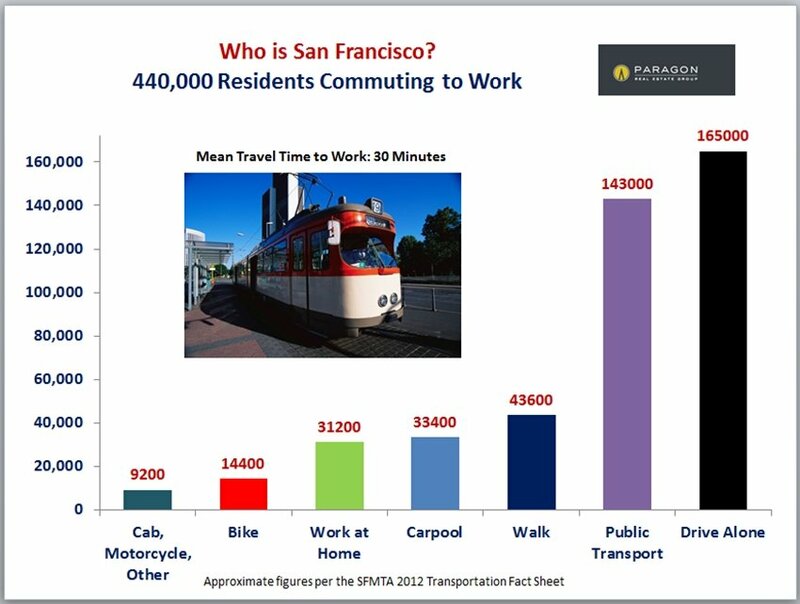 It might be a good match for the relatively young (but well paid), non-driving, high-tech workers pouring into the city. 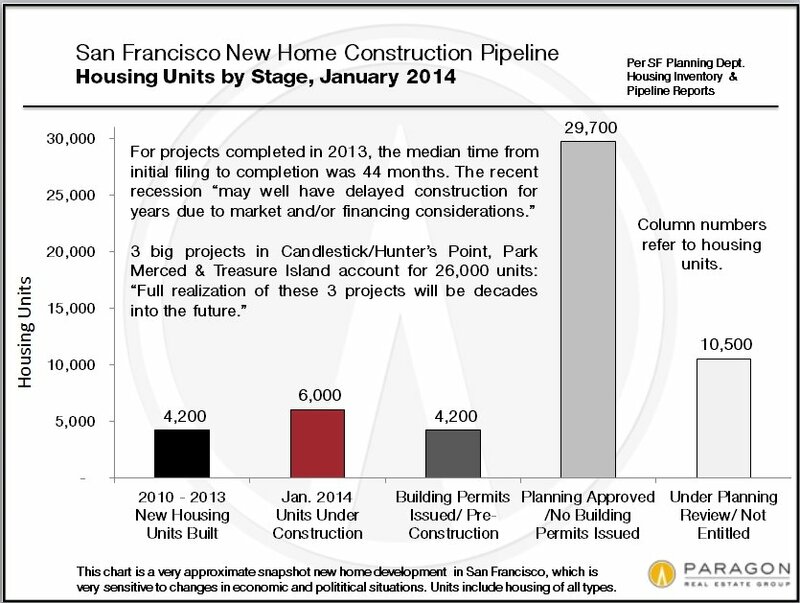 Three issues regarding new condo construction: the year in which a project is designated as “completed” in city reports can vary, depending on the department and the dating of events within the process (so this chart won’t perfectly tally with others). 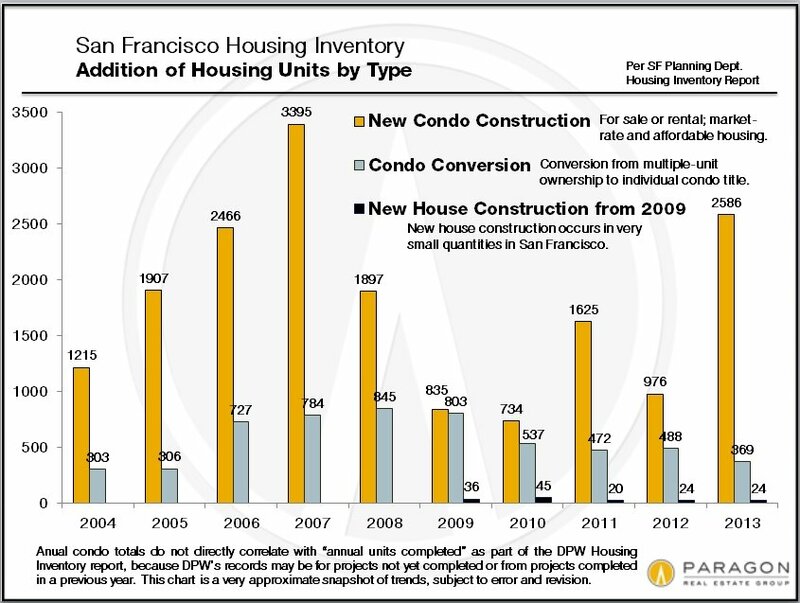 Secondly, some developers build and record the units as condos but then rent the units instead of selling them. Finally, new housing projects are now typically required to sell or rent about 15% of units under affordable-housing rules. 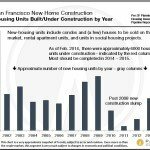 All these factors affect how new condo construction impacts rental and sale markets.“Single-family building construction made up a very small proportion of new con­struction in 2013 (1%).” Very few new houses are built in San Francisco, as developers prefer to build higher density housing projects on our limited supply of land. The houses that are built are typically big and expensive. 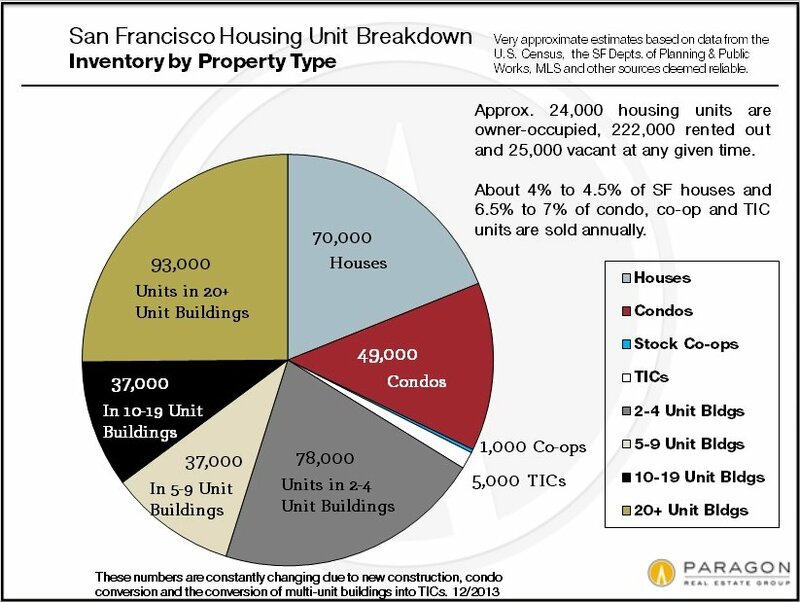 “Seventy-six percent of the condominium conver­sions in 2013 (279) were in buildings with two or three units.” The rules governing condo conversion in San Francisco are byzantine, politically-wrought and ever-changing, and the changes affect the ability to convert existing multi-unit properties and TICs into condominiums. Two-unit properties are much the easiest to convert into condos and accordingly enjoy a sale price premium. The first golden age of SF apartment buildings, many of which were later turned into condos, was in the period of 1920 – 1940: The units in these buildings are large, light, gracious and filled with elegant detail. Pacific Heights and Marina are filled with these buildings. Though there are beautiful condos built in other eras (Edwardian flats, Art Deco apartments), the second golden age really arrived with the latest burst of new-condo construction, built for an increasingly affluent population: These units are ultra-modern, high-tech and feature highest quality finishes and amenities. 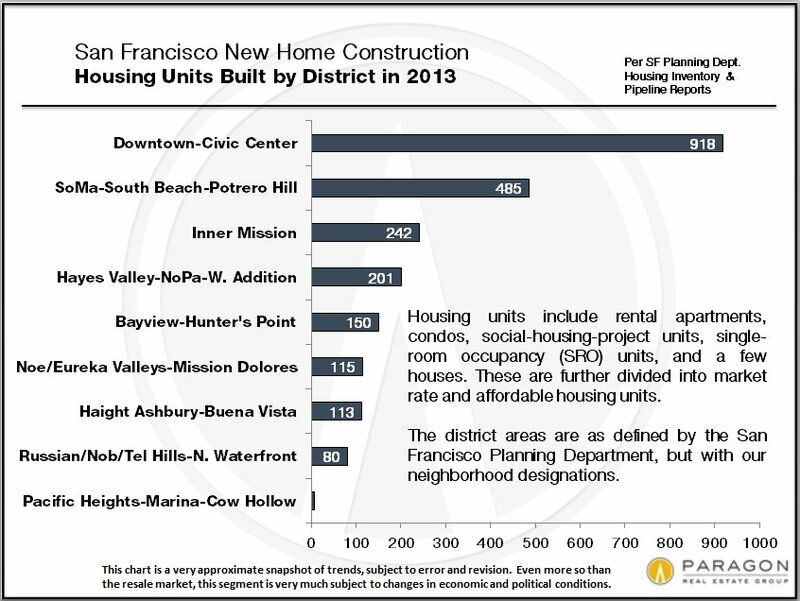 They are exemplified by the new, luxury high-rises of the greater South Beach-Yerba Buena area, though variations on this theme, in non-high-rise form, have been springing up all over the city.The units in these newer buildings command a premium both when rented or, as seen in the chart above, when sold – now surpassing an average dollar per square foot value of $1000. This is the major motivator for developers today. 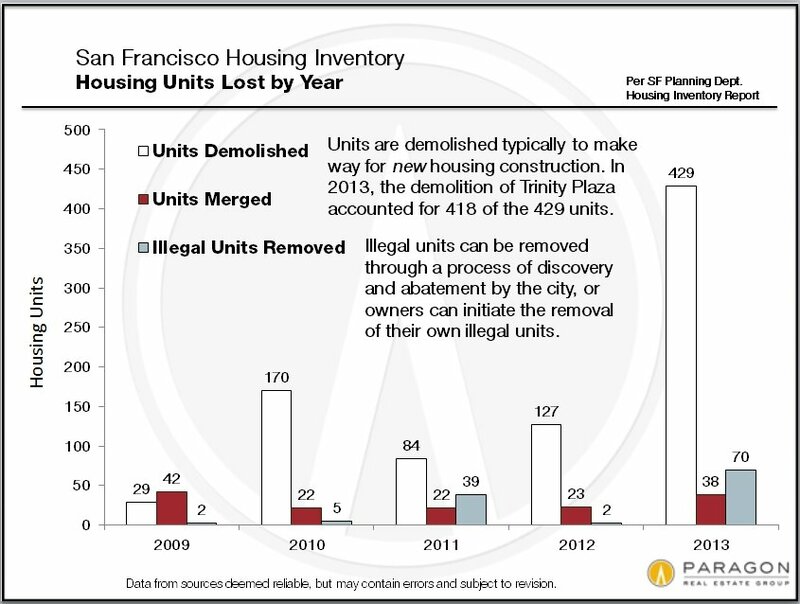 There are not only new housing units being built, there are existing housing units being removed from the city’s inventory of housing stock – demolished, merged (2 or more legal units into 1) and abated (illegal units): one less the other equals the net housing unit increase.There is currently proposed legislation to encourage the legalization of illegal housing units in San Francisco, estimated to exist in the tens of thousands. This is problematical because the reason most of these units are illegal to begin with is that they don’t conform to housing codes – ceiling height, light and ventilation, and fire safety issues are most common – and cannot easily, without substantial expense, be altered to comply. 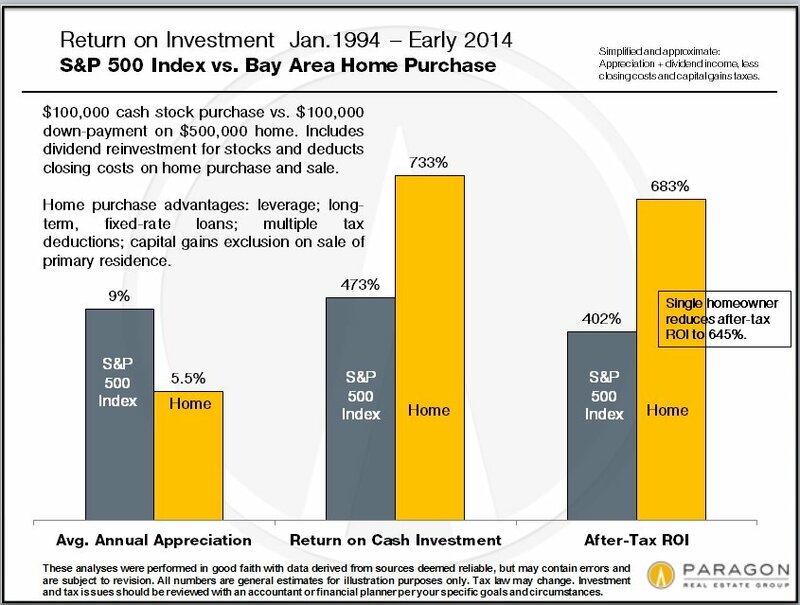 This is another approximate snapshot of how general economic conditions affect new housing construction. When the financial markets crashed in 2008, new construction went into a tailspin due to demand and financing issues. As the economy has recovered, it has sprung back to life – as is clear by all the cranes stalking the city’s lots. 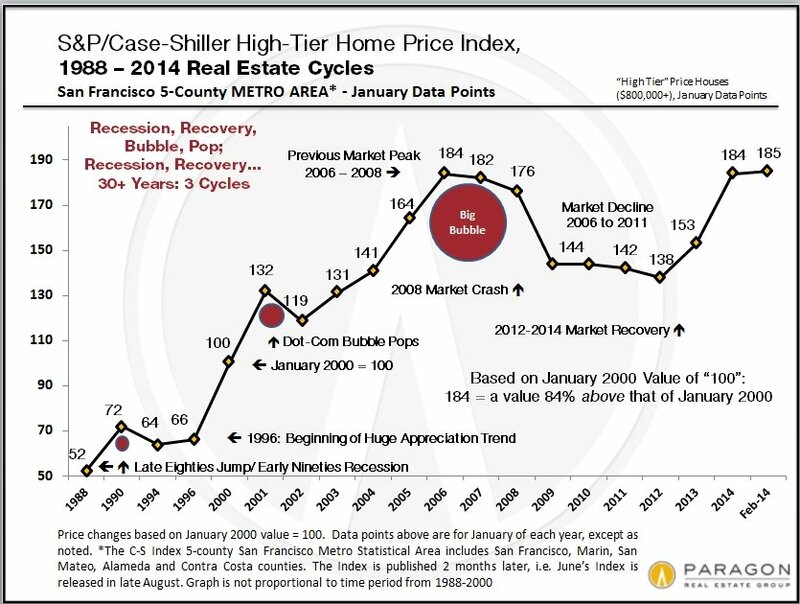 Like most financial markets, real estate development has economic cycles – cycles that often include dramatic booms and crashes. This is exacerbated by the length of time between a developer’s initial plan and land purchase, and the completion of the project, which often runs to years. It can be difficult enough to predict what market conditions will be next month, much less in two, three or more years. 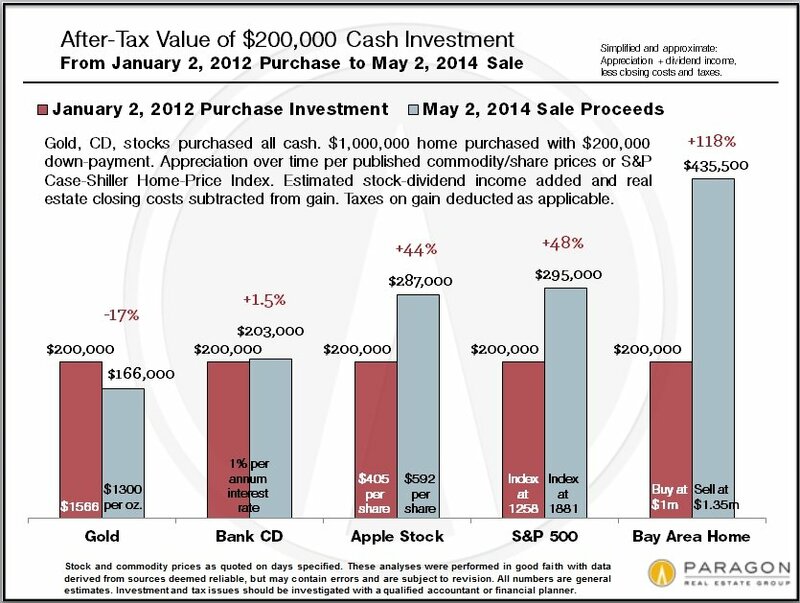 We created this chart in 2013 with data compiled from a variety to sources we deem reliable. 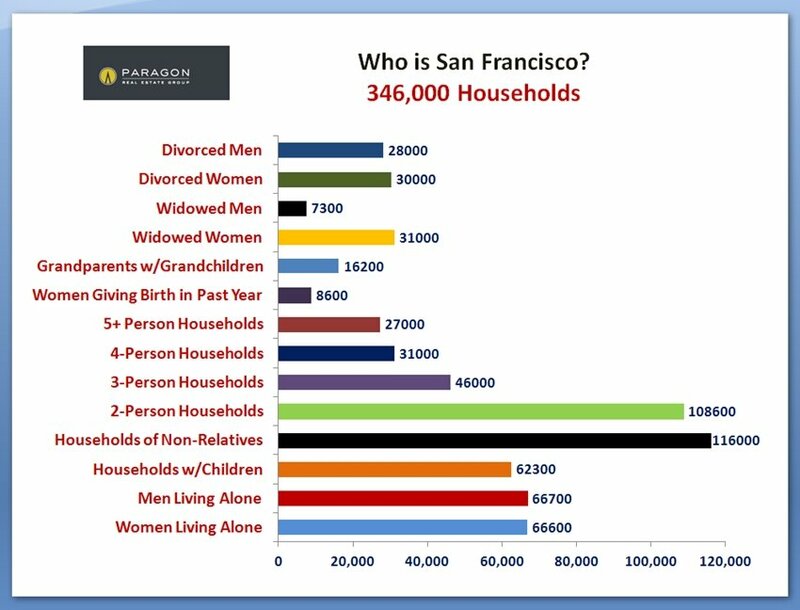 All the numbers should be considered very approximate – and they are constantly changing – but the chart is generally representative of the existing housing breakdown in San Francisco. 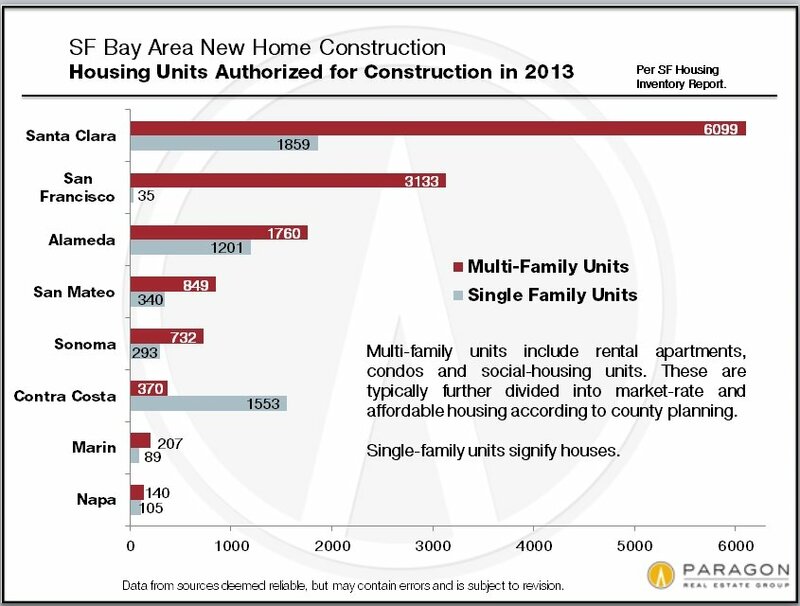 New home construction in the Bay Area is currently concentrated in 3 of the 4 hottest rental and/or purchase markets in the country: the greater Silicon Valley area, San Francisco and the East Bay. 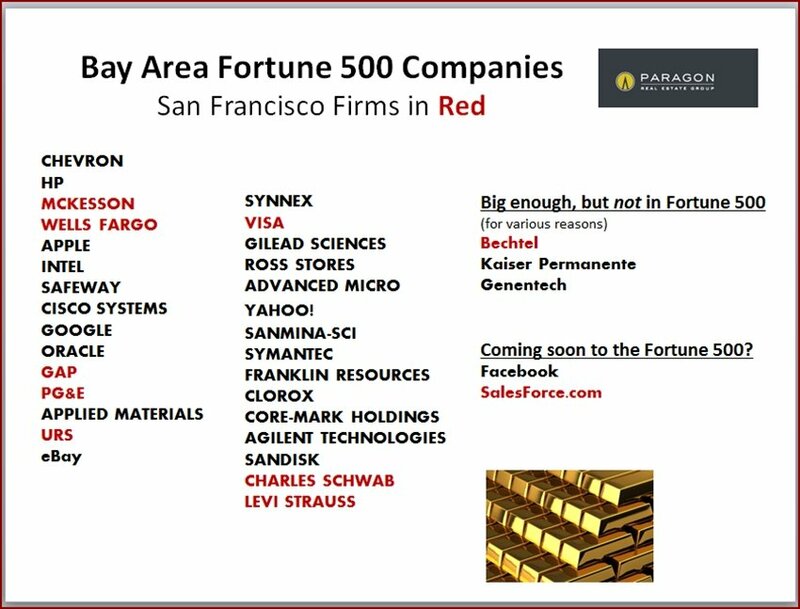 Of course, much of this is directly related to surging high-tech employment and wealth. What ultimately underpins new housing construction is demand. 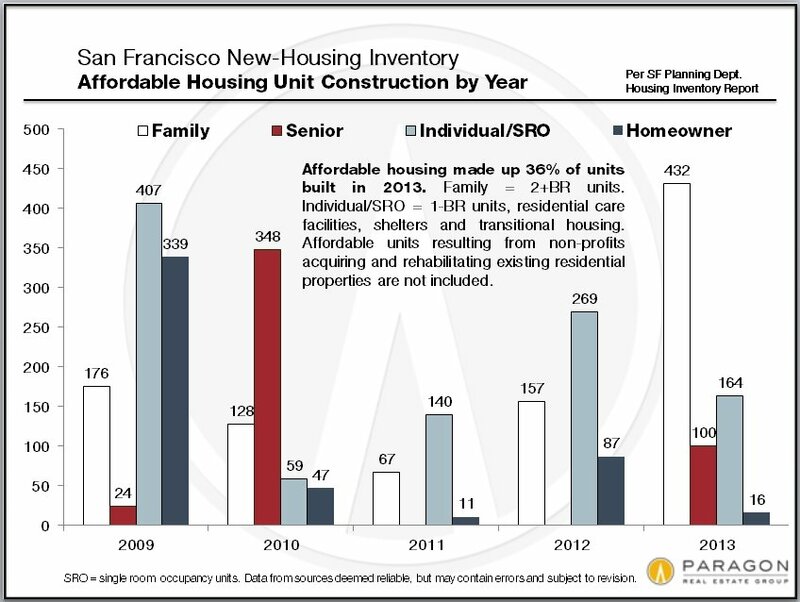 Below are two charts illustrating the white hot rental and sale markets in San Francisco, which are motivating investors and developers to build new homes, and motivating the city and non-profits to accelerate the construction of affordable housing units as well (a very big political issue right now).From 2010 to 2013, the city added approximately 32,000 residents and increased the number of employed residents by roughly 56,000, many of them in new, well-paying high-tech jobs. In that same period, about 4,200 new housing units were added, not remotely adequate to meeting demand. And it is currently projected that the city’s population will continue to grow in coming years. When demand soars and supply is inadequate, prices and rents go up (in the city’s recent case, feverishly), and builders start building again as quickly as they can, hoping to catch the wave at exactly the right time. For most of the past 20 years, the Inner Mission has been a flashpoint. 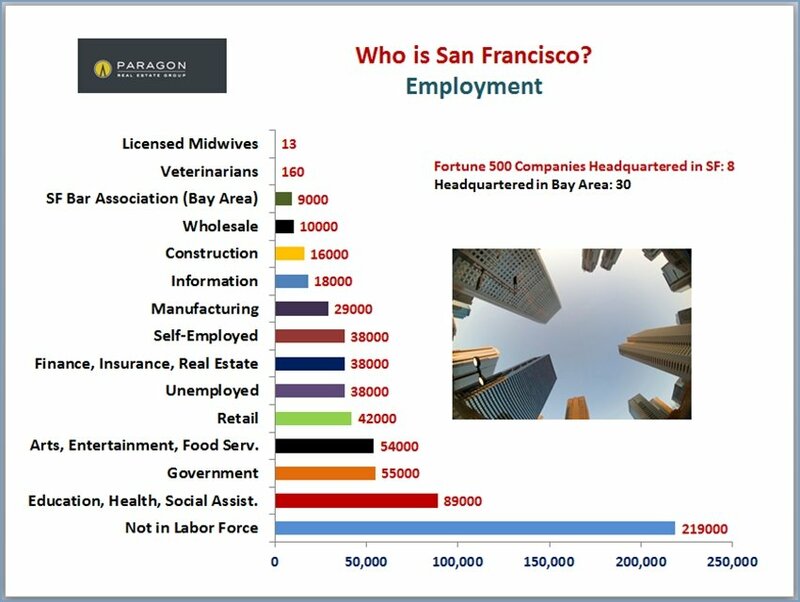 Since the first early 1990s dot-com start-up set up shop in the neighborhood, the debate has raged over who “owns” the large swath of central-eastern San Francisco bounded by Market Street (north), Cesar Chavez Street (south), Potrero Avenue (east) and Valencia Street (west). Today, skyrocketing real estate prices and high-visibility corporate shuttle buses have emotions running higher than ever, with local activists calling for a “return” to the Inner Mission of the past. Anyone familiar with this vibrant district’s history, however, might want to ask the latest round of protesters this: to which “past” are you referring? The Mission of 2014 resembles the Mission of 1994 no more than the Mission of 1994 resembles the Mission of 1974 or 1954 and so on. This is a place defined by change. Because it looms so large in the imaginations of San Franciscans (and those beyond), the Inner Mission is too often characterized by brief glances, which is unfortunate. There is far more to this physically large district than cool restaurants, hip bars and bearded young tech workers. They’re there, of course, and they earn the Inner Mission, especially along Valencia Street and to a lesser but growing degree, Mission Street, its cache as San Francisco’s most exciting nightlife district. Some of the city’s most notable restaurants – like Flour + Water, one of Travel & Leisure’s “Best Restaurants in the U.S.” – are in the Inner Mission, as are a number of creatively dynamic theaters and art galleries and, of course, an abundance of cutting-edge startup businesses. But this place is more than a cool address. Away from the hubbub of Mission and Valencia there are tree-shaded streets, remnants of a time when the Inner Mission was a desirable address for San Francisco’s upper class. Drawn by its sunny weather than recent streetcar proximity to downtown, they built ornate Victorians on the narrow streets between Mission and South Van Ness, Folsom and Harrison. Many of them still stand; few have been restored to their former glory. Today they are homes to a working-class population that has been in the neighborhood for close to a century. Though it’s a place of constant change, the Inner Mission has always made room for long-time residents and families, the sort of locals that become the fabric of any vital neighborhood. The Inner Mission has a long history of diversity, stretching back to its days as a neighborhood of Irish, Polish and German immigrants and into the post-World War II emigration of Central and South Americans that gave the district its present-day Latino flavor. Anyone looking for evidence of the Inner Mission’s constant change need only to stroll down Mission Street, where in some spots Spanish is spoken exclusively, then note, only a few blocks away, the Polish Club of San Francisco, at its present 22nd Street location since 1926, or stop at any of the neighborhood’s many Irish bars, in place for decades. Or they can explore the Inner Mission’s northeastern quadrant, where they’ll find warehouses and small factories, commercial buildings that have served a myriad of purposes during their long histories. On Alabama and Florida Streets, furniture refinishing shops abut galleries, body shops call vegan cafes “neighbor.” Landmark buildings like the San Francisco Armory recall colorful histories that include serving as the city’s primary sports arena (it hosted, among other things, several heavyweight bouts during the 1920s, 30s and 40s), a soundstage for the original Star Wars, and, most recently, an internet concern that makes adult films. The Inner Mission was once where professional baseball happened in San Francisco. No fewer than three ballparks called the district home, including, famously, Seals Stadium on 16th Street. The longtime home of the Pacific Coast League San Francisco Seals (at one time one of two Mission-based PCL teams, the other being the Mission Reds) was also where the newly-relocated Giants played their first few seasons in San Francisco, beginning in 1957. Factories, ballparks, amusement parks (Woodward Gardens, 1866-1891), mansions and even a native accent – people speaking the “Mission dialect” were said to “talk like Brooklynites – adds up to an unavoidable fact: that there is far more to San Francisco’s Inner Mission than restaurants, bars and hipsters. South Beach is a district with many distinct personalities — ranging from its Financial District-adjacent hyper-urban vertical self to the quiet dignity of South Park and the shiny waterfront surrounding AT & T Park. It makes perfect sense that a neighborhood of such dimension would have an equally broad housing market, and South Beach does. South Beach is a district with many distinct personalities — ranging from its Financial District-adjacent hyper-urban vertical self to the quiet dignity of South Park and the shiny waterfront surrounding AT & T Park. It makes perfect sense that a neighborhood of such dimension would have an equally broad housing market, and South Beach does. While it lacks a single-family home option (common for a downtown neighborhood), South Beach checks almost every other housing box. Are you just out of college, newly well-employed, looking for a studio or one-bedroom apartment in a buzz-worthy location? South Beach has you covered with large complexes like the South Beach Marina and, scattered throughout the district’s southern quadrant, a smattering of small, SoMa-like Edwardian buildings. Are you a wealthy empty-nester or international “citizen of the world” who desires a super-urban pied-à-terre perfectly situated to take advantage of one of the world’s most desirable cities? How about a sleek upper floor unit at a full-service luxury high-rise like the Infinity, the Metropolitan, the Watermark or One Rincon Hill? Or maybe you’re a successful technology entrepreneur whose dream is a huge, cutting-edge living space showcasing modern design and views of leafy South Park; South Beach has those too, along with lofts in new and refurbished historic buildings, boutique condo buildings and sprawling, early-generation complexes like The Beacon and The Brannan, offering proximity to the waterfront, the ballpark and the growing King Street shopping and dining corridor. South Beach doesn’t have everything, but it does have something for almost everyone. If that weren’t enough, South Beach is also growing faster than any San Francisco neighborhood outside of Mission Bay. Pause for a moment at the corner of Beale and Folsom Streets, in South Beach’s Rincon Hill section; to say that there is construction happening on all four corners is only a slight exaggeration. It’s happening on three, all in the shadow of South Beach’s landmark residential tower, One Rincon Hill. 50-story One Rincon stood alone, towering above warehouses and low-lying commercial buildings, for several years. Soon it will have neighbors of similar scale to its own. “Vancouverism” creates room for boutique condo buildings like newly-completed 14-unit 750 2nd Street, for smaller-scale, pedestrian-friendly commercial strips (the 2005 plan designates Folsom Street as one of these) and for existing warehouse buildings like the South End Historic District, in entirety, to co-exist with massive towers like One Rincon Hill. South Beach, already unique because of the housing diversity within its borders, is designed to stay that way. Like neighboring Yerba Buena, South Beach tilts toward the high end of the real estate market. A recent check of the Multiple Listing Service revealed 32 active South Beach listings. 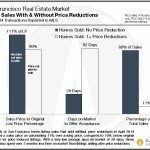 Of those, 18 were priced above $1 million, with a third asking north of $2 million and a median asking price of $1.2 million. Four were lofts, priced in a range of $749,000 to $1.375 million. The rest were condominiums. 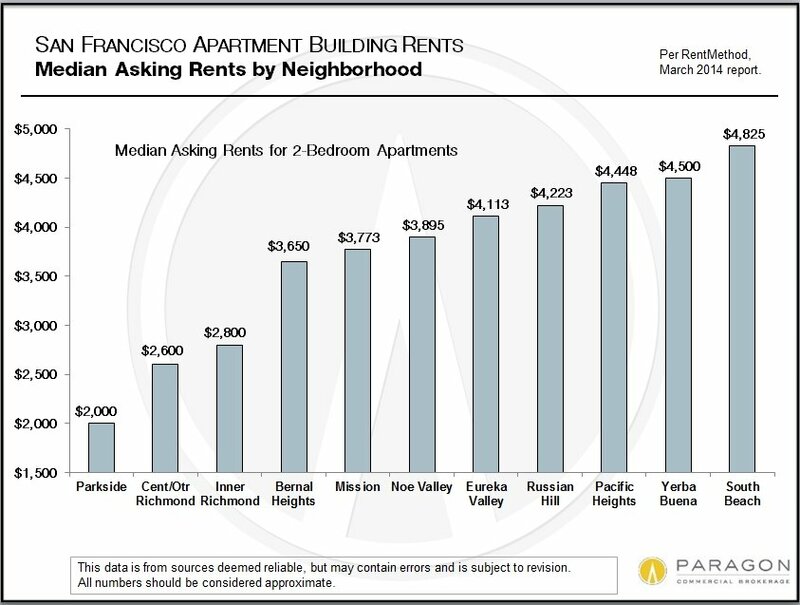 For those looking to rent in South Beach, be aware that neighborhood rents run between $500 and $1,000 higher than those in the rest of San Francisco. Expect to pay upwards of $3,000 per month for a one-bedroom unit in South Beach. It’s not cheap but it is exciting, convenient and chic. 20 years ago, modern South Beach didn’t exist. 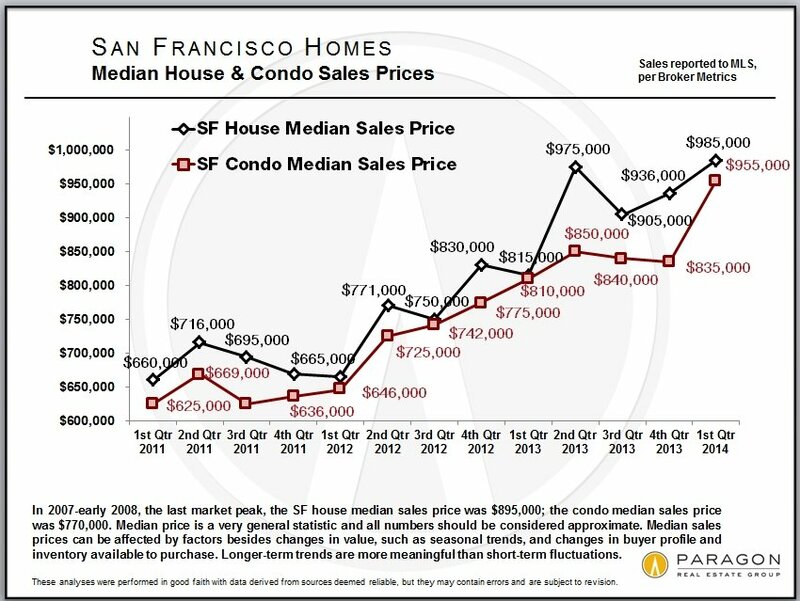 Today it’s one of San Francisco’s most popular downtown neighborhoods.